The heart of our mission is protecting the natural lands and waters that make Minnesota amazing. Since our first project in 1993, we have protected over 57,000 acres of habitat and 1.6 million feet of shoreline across our state. While Minnesota has many acres of land devoted to public parks and natural areas, there are countless places where development and other land uses threaten the quality of wildlife habitat or the purity of our waters. These are the farms, forests, natural shorelines and undeveloped properties owned by individuals and families that when protected, add value to the public lands that already serve us well. 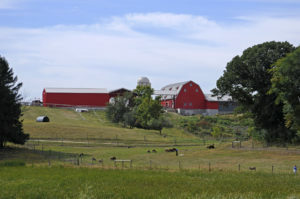 Gale Woods Farm, part of the Three Rivers Park District in Hennepin County, protected with a conservation easement in 2002. Photo by Derek Dickinson. Our primary protection tool is a conservation easement, where landowners voluntarily give up development rights on their land in perpetuity, keeping it in its natural state. The Land Trust holds almost 98% of all non-profit conservation easements in the state of Minnesota. Conservation easements are voluntary agreements through which landowners limit the use and development of property in order to permanently preserve its natural or cultural features for public benefit. A conservation easement is a legally binding and recorded document. In order to protect these conservation values, certain restrictions on use of the property and the reserved rights of the landowner are detailed in the conservation easement. The easement is conveyed to a non-profit conservation organization such as the Minnesota Land Trust, or a government agency at signing. Once signed by the landowner and the easement holder, the document is filed with the local county land records. Each conservation easement held by the Minnesota Land Trust is unique and is individually crafted to reflect the special characteristics of the land and the particular situation of the landowner. Read more about how conservation easements work. Minnesota’s extraordinary lakes, rivers, forests, and prairies form the essential character of our state. Now, with escalating threats to our natural systems, the Land Trust has set an ambitious goal: protect 50,000 acres of Minnesota’s most vital lands forever and to restore another 3,000 acres over ten years. We will also develop engagement programs in three communities – modeled on our successful Recreational Lands program in Duluth – designed to connect more people to the outdoors. This Conservation Agenda is the Minnesota Land Trust’s blueprint that will double the pace of our work and will ensure permanent and meaningful natural resource conservation to benefit all Minnesotans. By 2027, the Minnesota Land Trust will have completed 1,000 projects protecting 100,000 acres of land and 2,000,000 feet of shoreline. We will have completed 3,000 acres of restoration and 3 community engagement projects. Based on a thorough review of scientific data, the Minnesota Land Trust has identified 11 Program Areas around the state where our conservation work will be targeted over the coming decade. Each Conservation Program Area is defined by its unique set of physical and biotic factors. Each identifies a location where the best examples of Minnesota’s iconic biota – species and natural communities – are located and where significant opportunities exist for the Land Trust to protect and restore these important resources over time. Through targeted protection and restoration efforts, the Land Trust will conserve complexes of high quality natural habitat that are meaningful for wildlife, clean water, outdoor experiences, and scenic beauty. Our conservation goals and the strategies we will employ to reach them differ for each Program Area and are based upon the varied characteristics and opportunities of each. Land protection will be the primary focus of the Land Trust’s work in all 11 Program Areas. Within a subset, restoration strategies will also be employed. Three Program Areas are targeted for community engagement initiatives where we will create outdoor opportunities to entice all Minnesotans to explore and enjoy these treasured places.